Today I have a great holiday card to share. I dug out my old October Afternoon Holiday Style paper and found this great holly pattern to inspire my card. I used the Lawn Fawn stitched rectangle dies to cut my holly panel and I inked the edges with Antique Linen distress ink to give it a more antique look then I matted it with dark red card stock on a cream colored card base. 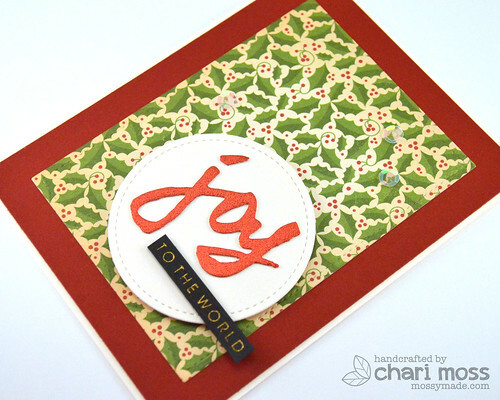 I used the new stitched circle dies to cut some cream card stock for my sentiment. 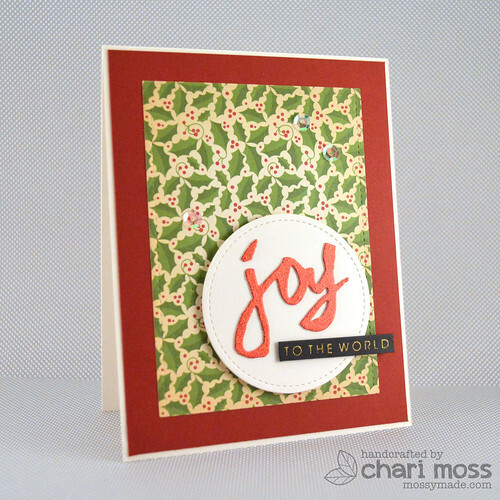 For the sentiment I used the Brushstroke Joy die from Essentials by Ellen to cut some metallic shimmery red paper I had in my stash. I stamped the rest of the sentiment in Delicata gold ink on black yardstick and layered it under the die cut with some thin foam squares. I finished it off with a few clear iridescent sequins.